The time has come for the selection of a new Chancellor at Argent University of Magic, and you are among the likely candidates for the job. Gather your apprentices, ready your spellbook, and build your influence, while secretly discovering and competing over the votes of a limited Consortium of influential board members. Only the one who is able to fulfill the most criteria will be claim the title of most influential mage in the World of Indines! 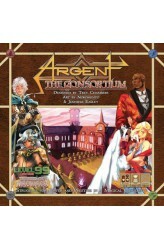 Argent: The Consortium is a cutthroat worker-placement/engine-building game of manipulation and secrecy in which the criteria for victory are secret and the capabilities of your opponents are constantly changing. You'll need to outwit the other candidates, use your spells at the right moment, and choose the correct apprentices to manag..
BattleCON is a fast-paced head to head card game for 2 players, based loosely around the mechanics and tactics present in 2D fighting games. In BattleCON, players choose characters with unique abilities and powers to test against one another in a battle of tactics, strategy, and intuition. 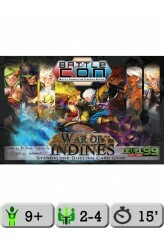 BattleCON: War of Indines is a standalone dueling card game designed for head-to-head play. Each player selects a character who uses a unique gameplay mechanism to give them an edge in combat. Take control of 18 different characters, from a fire elemental, an ocean guardian and her panda familiar, a space-bending trapper, a shadowy assassin, and more! 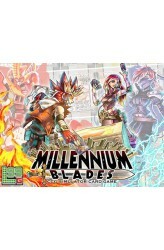 Each character's play style requires new strategies, but uses the same foundational tactics, making a new character easy to learn, but challenging t..
Millennium Blades is a CCG-Simulator -- A game in which you play as a group of friends who play the fictional CCG "Millennium Blades". In this game you will build decks, play the meta, acquire valuable collections, crack open random boosters, and compete in tournaments for prizes and fame. The game takes you from Starter Deck to Regionals in about 2-3 hours. Multiple games can also be chained together to form a Campaign, going from Regionals to Nationals in game 2 and from Nationals to Worlds in game 3, with each game introducing ever more powerful cards and higher stakes, but also resetting the power of the game so that each player has a fair chance to win each 'season' of the campaign. 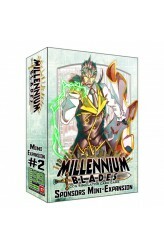 The game draws heavily on Manga/Anime inspiration for its art, and parodies Magic: ..
Nine new sets of promotional cards for use within the Millennium Blades Card Board Game. These cards feature characters from other Level 99 Games Products. Each promo set contains 6 cards, for a total of 54 cards. 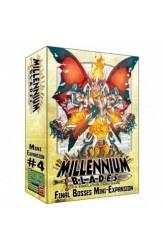 ..
Millennium Blades: Promo Pack #4 consists of four new Master-level card sets, each themed around one of the bosses in the Cooperative mode of the Set Rotation expansion. 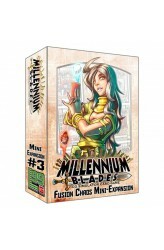 ..
Millennium Blades: Promo Pack #3 introduces two new playable characters to the game: Raritti, a master of card fusion, and Shafille, a CCG archaeologist. .. 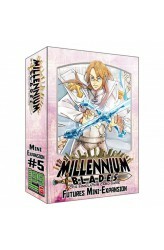 The Futures Mini-Expansion includes 9 new Promotional Card sets (54 cards) for Millennium Blades, featuring characters from up-coming Level 99 Games projects, such as Seventh Cross, Esper X, Trials of Indines, and Duelist Library! 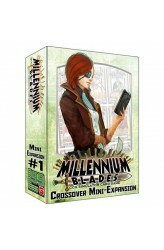 ..
Millennium Blades: Set Rotation includes 12 new card sets, giving you half again as much content as the base game, opening up even more variety. 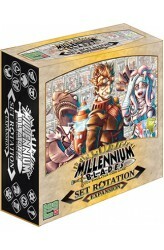 Set Rotation is designed with advanced gamers in mind, and gives you additional depth and strategy for experiencing Millennium Blades. The card sets are: The Thousand-Pixel Cabinet - Classic arcade homages galore! Quantum Jump - In space, no one can hear you flip cards. UUUuurrrrrgh! - The obligatory zombie set. These guys just don't give up! Saved by the 90's - All our favorite pop-culture and TV references from decades past. Fast - Play your cards furiously with this action-inspired set! Shonen Leap - These cards are all about the power of friendship. Deus Rex Machina - Cyber..
Nine additional sets of promotional cards for use within the Millennium Blades Card Board Game. These promo sets were Sponsored by friends in the gaming industry who have offered to let us print some of their characters on promotional Millennium Blades cards! These cards will be hard to find outside the project. Includes: Mage Wars Promo Set UFS Red Horizon Promo Set Terrene Odyssey Promo Set Neuroshima Hex Promo Set Heroes Wanted Promo Set Frame Wars: Mechs Promo Set Frame Wars: Pilots Promo Set Resistor_Extra Core Cards Dragon Punch Extra Core Cards ..